Mid Day Meal Scheme, Charaideo. Applications are hereby invited From eligible candidates for one (01) No. 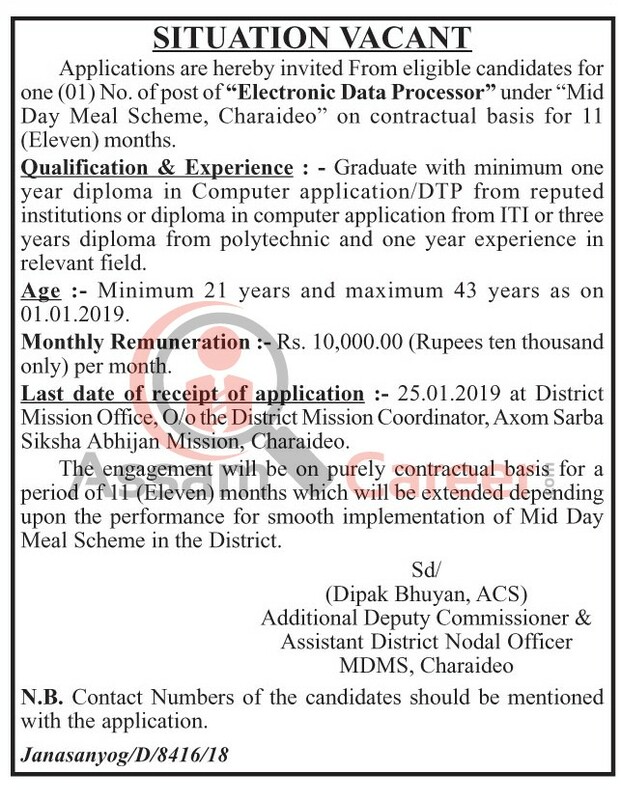 of post of "Electronic Data Processor" under "Mid Day Meal Scheme, Charaideo" on contractual basis for 11 (Eleven) months. Educational Qualification & Experience: Graduate with minimum one year diploma in Computer application/DTP from reputed institutions or diploma in computer application from ITI or three years diploma from polytechnic and one year experience in relevant field. Monthly Remuneration: Rs. 10,000.00 (Rupees ten thousand only) per month. Address: District Mission Office, 0/o the District Mission Coordinator, Axom Sarba Siksha Abhijan Mission, Charaideo. How to apply: Applications should be send to the above address by 25.01.2019. The engagement will be on purely contractual basis for a period of 11 (Eleven) months which will be extended depending upon the performance for smooth implementation of Mid Day Meal Scheme in the District. Contact Numbers of the candidates should be mentioned with the application.